The catalogue page shown here is from the Brockwitz 1928 Musterbuch (catalogue). 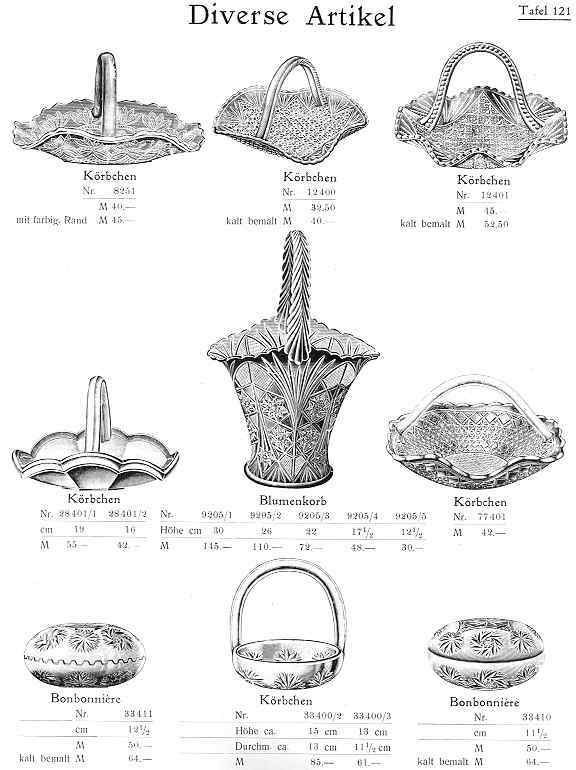 It shows several handled baskets (körbchen or henkelkörbe), some of which were also shown in earlier Brockwitz catalogues. To date, only one Brockwitz basket has been reported in Carnival Glass - Galactic Beauty, shown in the centre of the middle row, and pictured above. Top row: basket 8251 (left) is in the Brockwitz pattern Louise (aka Luise). The baskets top right and center (12400 and 12401) are both in the Brockwitz pattern Koh-i-Noor (aka Miniature Hobnail) and are also illustrated on pages that show the full pattern suite. Middle row: the small basket 28401 (left) is in the Chicago pattern, while the tall flower basket in the center is the only one we can report with certainty in Carnival (we own an example, so we are sure of our facts) - Galactic Beauty. On the right of the middle row is a shallow handled basket (77401) with a very complex diamond and star design. The pattern is familiar but we can't name it at the moment. Bottom row: are two bonbons and a basket in the Elektra design. Although the page above is from 1928, many of the items illustrated were shown in Brockwitz catalogues as early as 1915. A few other baskets were also illustrated later, from well-known Brockwitz pattern suites. Antigone, for example and also Hamburg (a very elegant pattern featuring plain panelled sides and with roses impressed on the base). Brockwitz also made a Curved Star (aka Zurich) basket with an applied handle (not so far known in Carnival). In the past, other Carnival Glass baskets have been attributed to Brockwitz: patterns such as Maple Leaf, Fleur de Lys, George VI and similar baskets. However, these baskets are not in the Brockwitz catalogue, and our recent research led us to the discovery that they were in fact made by the English glassmaker, Matthew Turnbull. See the Matthew Turnbull revelation.